Der Artikel Amy Ingrid Schlegel: Günther Selichar wurde in den Warenkorb gelegt. Günther Selichar's preferred thematic field of work, and his oeuvre has revolved around it since the early 1980s, is the media and mass media. 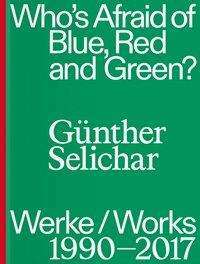 This publication not only documents in its entirety what is probably his most extensive body of work Who's Afraid of Blue, Red and Green? (1990-2017), which comprises 30 projects working with photography, painting, print and most notably public (media) space, but also includes references to all important work series made during this time and connected to it in terms of content, as well as the cooperations with his wife, Loredana Flore-Selichar. The book further brings together texts written by longstanding companions, both theorists and curators, as well as interpretations by a younger generation of writers from the US, Germany, Switzerland and Austria, who approach this multi-layered and much discussed oeuvre in an extremely interesting way, and a text by Günther Selichar himself, in which he reveals programmatic reflections on the thinking behind his work. The book was meticulously and elaborately designed with three different covers by Leipzig based graphic design agency Lamm&Kirch. Dieter Buchhart arbeitet als Kunstkritiker für Kunstforum International und andere Kunstmagazine. Marc Ries (Dr. phil.) lehrt Medientheorie und Ästhetik an der HGB Leipzig und im Studiengang MultiMediaArt der Fachhochschule Salzburg. Dieter Ronte, geboren 1943 in Leipzig, studierte Kunstgeschichte, Archäologie und Romanistik. Von 1979 1989 leitete er das Museum Moderner Kunst Wien, 1989 1993 Direktor des Sprengel Museum Hannover, 1993 2006 Direktor des Kunstmuseum Bonn. Daneben zahlreiche Lehraufträge und Gastprofessuren. Er war ein enger Freund von Adolf Frohner und ist seit 2007 Direktor des forum frohner.